N. Dhikeos (his stamp, not in Lugt). M. Newcome Schleier, 'Other Drawings by Valerio Castello' in L'Arte del Disegno; Christel Thiem zum 3 Januar 1997, Berlin, 1997, p. 151, no. 12. 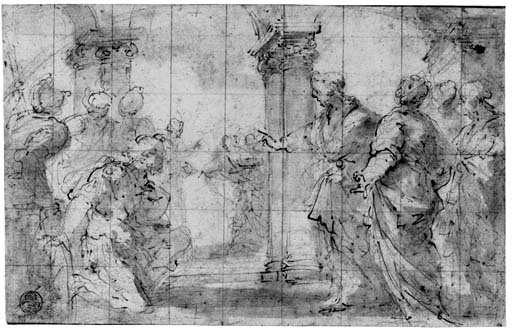 A preparatory study for the Christ and the Centurion, one of five paintings of the Opere della Misericordia commissioned from Castello in circa 1646 by the P.P. Ministri degli Infirmi for the Sacristy of the Church of San Camillo e Santa Croce, Genoa, C. Manzitti, Valerio Castello, Genoa, 1972, pp. 144-145, no. 68. A comparable study for another painting of the Misericordia series, The Vision of Saint Camillo to Saint Filippo Neri, is in the Kunstmuseum in Düsseldorf, M. Newcome Schleier, 'The Drawings of Valerio Castello' in Master Drawings, 1975, XIII, p. 35, no. 4, pl. 9.